Thousands have marched in Bangladesh's capital to call for greater government protection following Saturday's attacks on an opposition rally that killed 17. All major opposition parties attended, demanding people observe a general strike on Tuesday and Wednesday. About 20 people were hurt in scuffles with police and political opponents. Leader of the opposition Awami League, Sheikh Hasina, who escaped the blasts unhurt, has blamed the government for the attacks - a charge it denies. Many schools were closed on Monday and police maintained a heavy presence in Dhaka for the rally of around 3,000 people. 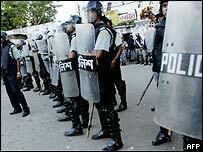 Scuffles broke out between protesters and rival activists from the ruling Bangladesh Nationalist Party (BNP). About 25 vehicles were damaged, police said. The BBC's Waliur Rahman in Dhaka says political leaders who spoke at the rally denounced the government's failure to protect national figures like Ms Hasina and demanded Prime Minister Khaleda Zia resign. Protests were also held in Sylhet, Chittagong and other cities. 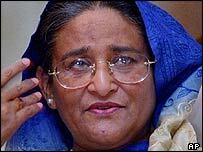 Saturday's attack took place soon after Ms Hasina had addressed about 20,000 people. Ms Hasina said: "I had barely completed my speech and was going to get down from the truck, I heard a big bang and the next moment blood splashed on my body. "A security guard helped me sit on the truck while other grenades started to explode one after another. "In a few moments, leaders and security members formed a human shield around me and helped me get into my car. Then came bullets hitting my car one after another." No one has yet said they carried out the attacks. No arrests have been made but some media reports suggest investigators are focusing on Islamic militant groups. Ms Hasina blamed the government, saying police had refused to hand over bodies and had barred relatives from holding funerals. The government has denied any involvement and has promised a proper investigation. Abdul Mannan Bhuiyan, senior leader of the ruling Bangladesh Nationalist Party, said: "There is no truth in the allegation of the opposition leader. No government can stage such [an] incident." On Monday, Prime Minister Zia visited some of the injured in a Dhaka hospital, including senior Awami League leader, Ivy Rahman. However, Ms Hasina refused to receive the premier at her home. Doctors at two Dhaka hospitals say about 20 people are still being treated for serious injuries. The attacks triggered protests and violence. In Dhaka on Sunday, about 25,000 people attended a mass funeral prayer meeting and at least 17 people were hurt when a passenger train running between Chittagong and Dhaka was set alight by protesters. US Secretary of State Colin Powell made a telephone call to Ms Hasina and later issued a statement condemning the attack. "The perpetrators of this heinous act clearly intend to undermine the democracy in Bangladesh. They must not succeed," he said. "The government has told the police they must do everything possible to catch those responsible"